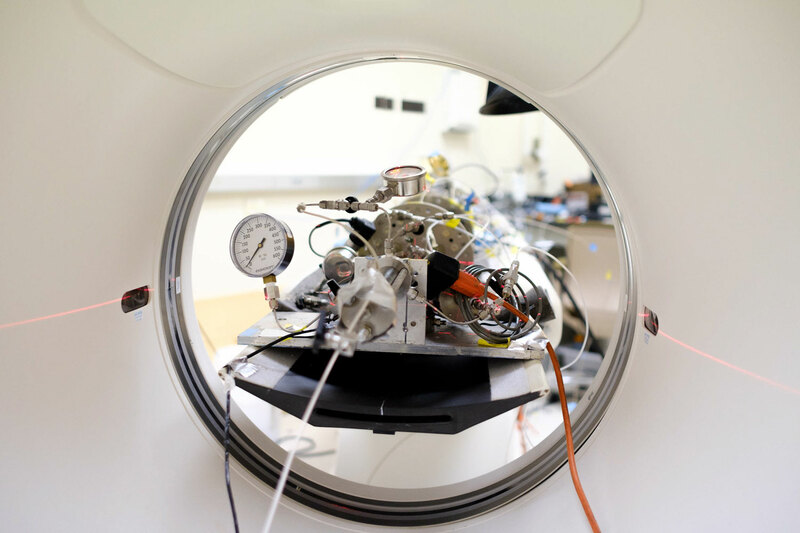 Of the approximately two dozen medical CT scanners scattered throughout Stanford’s main campus and medical centres, two can be found nestled in basement labs of the Green Earth Sciences Buildings. The scanner duo is being put to some decidedly off-label uses in research led by Anthony Kovscek, a professor of energy resources engineering at Stanford’s School of Earth, Energy & Environmental Sciences (Stanford Earth). The machines in this case have helped scientists extract oil and gas more efficiently, and are now revealing ways of storing CO2 deep underground while the world continues to rely on fossil fuels for energy and transportation. The motorised tables that would normally slide patients in and out of the scanners’ openings instead support machines made from a daunting array of connected pressure vessels, nozzles and gauges shrouded beneath wires and tubing. The larger of the two scanners is about the length of a person and looks like something devised by a mad scientist to power a time-traveling DeLorean. “I’ll still sometimes say ‘Whoa’ when I see it,” said Muhammad Almajid, a graduate student in Kovscek’s lab. The ad hoc devices, which Almajid and his colleagues painstakingly craft and assemble by hand, are designed to force pressurised oil, water or gas through slim cylinders of seemingly solid rock, which the scanners then analyse with X-rays. The lab experiments are intended to recreate, in miniature, the movement of various substances through vast rock formations and to provide real-world validation of computer simulations of the same processes. This type of experimentation and simulation has helped the United States move toward energy security by enabling the nation to tap vast reserves of previously inaccessible oil and natural gas, such as shale oil. But what’s learned from that mass of tubes and gauges could also help mitigate the effects of burning 100 million barrels of oil per day, which is expected to continue for at least 50 years while the world transitions to renewable energy sources. Results like the ones from Kovscek’s lab are now guiding new ways of sequestering the powerful greenhouse gas carbon dioxide, which is released from burning fossil fuels, deep within rocks, for eons, while avoiding leaks and other negative consequences – a strategy many experts say is going to be necessary in order to avoid the hazards of climate change. “Greater efficiency in oil recovery and conversion of the energy system to renewables has to happen. But there is a multi-decade period where we really have to make sure that CO2 emissions are under control while hydrocarbons are still being consumed at high rates,” said Hamdi Tchelepi, a professor of energy resources engineering who frequently collaborates with Kovscek. “The only way to achieve that is through a serious, large-scale deployment of carbon sequestration. It’s not optional. In the eyes of the scientific community, this has to happen.” Some of the strategies for efficiently extracting oil and natural gas from reservoirs that came out of work like Kovscek’s are also a first step toward carbon sequestration. Especially relevant is a practice called enhanced oil recovery (EOR) by gas injection, which involves pumping pressurised gases into existing oil fields to displace or reduce the viscosity of crude oil, making it easier to extract. Even the best performing fields still leave about 50% of oil in the ground, Kovscek said. For unconventional resources such as shale rocks, which are even more difficult to extract oil from, the recovery rate can be as low as 5%. “That means if we don’t do anything further on a well after the initial recovery, we’re going to leave as much as 95% of the resource in the ground,” Kovscek said. CO2, it turns out, mixes very well with crude oil, making it, in petroleum engineering parlance, an excellent “EOR fluid.” Thus, for decades now, and for its own purposes, the fossil fuel industry has been refining the process of injecting huge amounts of CO2 deep underground. The challenge for people like Kovscek and his colleagues is keeping that gas imprisoned underground and out of the atmosphere for long periods of time without unanticipated consequences. “Oil companies are mostly interested in what’s called the active injection period because their goal is to get a return on investment within one or two decades,” Tchelepi said.